Dharak Colossus is Dharak's mobile assault vehicle, or ultimate weapon. It is a combination of battle gears, forming a scorpion-like machine that boosts Dharak's attack power. It can be seen in the season 3 anime series, Bakugan Battle Brawlers: Gundalian Invaders, in episode 14 entitled "The Sacred Orb." It was the one that destroyed the second shield of Neathia with just one attack. Dharak Colossus is an evil and violent Bakugan monster with unthinkable power. 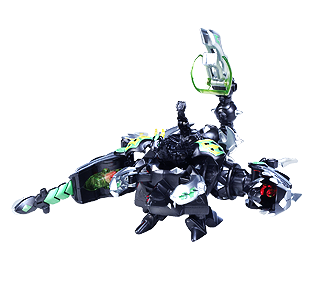 Features two massive claws and a giant scorpion tail that can each launch devastating attacks of Darkus energy. 1. Attach the Smashtor and the Riptor. Then deploy the feet. 2. Push the button to deploy the tail. 3. Drop Brawlacus Dharak and then lights on! As a whole, Dharak Colossus CANNOT be used in actual battle. However, we can use Brawlacus Dharak and the battle gears individually as regular Bakugan in a battle. And while they each have their own G-Power, Dharak Colossus does not. 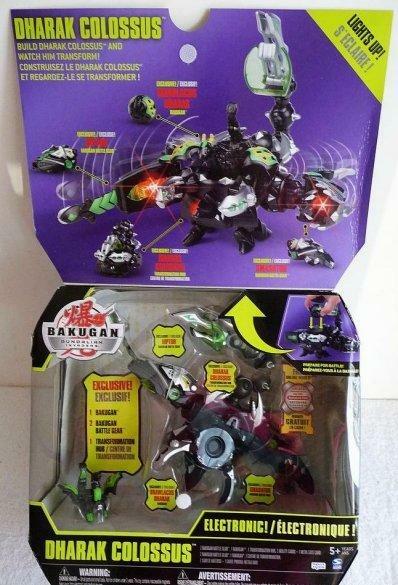 Dharak Colossus as a whole and the Bakugan and Battle Gears as individuals have their own unique DNA Codes you can use to upload them and add to your online collection. You can also use them in your brawls online.